There are moments where it is acceptable to complain about a sporting result. Say for example, a tight game where a referee makes a bad decision that directly effects the outcome of the game. Then there are moments where it is probably best to take it on the chin, and maintain a dignified silence. Say, for example, when your Grand Slam hopes have been shattered to pieces and handed to you in a 3-30 drubbing. Wouldn't you know it, England refused to take their 3-30 shellacking laying down. Naturally, it was all the referees fault! Back to that in a moment, but why are we saying England 'continues' to make a mockery of itself? What's that, you actually need evidence on this? Okay so! Lately, whenever England gets in sight of The Six Nations Grand Slam title, they go a little wobbly in the knees and also in the brain department. How about this lovely little shirt, available on the Internet, which those in authority in English Rugby thought would be a super idea. They probably should have waited, no? 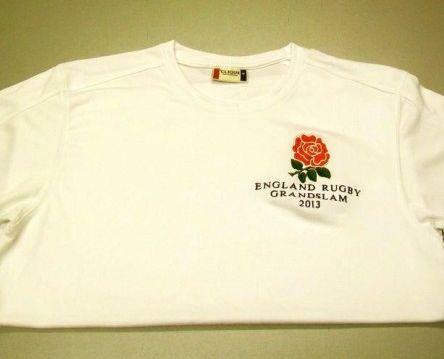 Enlish Grand Slam t-shirt - get yours on eBay! Then there is the little matter of that painfully embarrassing 2011 Grand Slam video Nike made for the English team. Sadly for all parties involved, it was released before the tournament was decided. Let's just say that didn't work out so well either (see Ireland 24 England 8). So what now? Well, in another painfully embarrassing 'brain burp', England seems to be attempting to insinuate match day referee Steve Walsh's erratic decision making caused the English downfall. This would be funny if it wasn't so pathetic. Whining like this might be somewhat understandable if the game had been anyway way close. However, the manner and ease with which Wales dismissed England mean that this pathetic whimper is at best childish, and at worst actually pretty insulting to Wales. The English Grand Slam hopes for 2013 were absolutely obliterated by a red tide of Welsh passion and skill, suggesting anything else is a fools game. However, English Rugby does have priors, and we would have to assume will continue to wilt like flowers in winter at the mere sniff of a Six Nations Grand Slam.